Wales, like all ancient civilisations, is a land and a people of myth. The dragon is a creature of legend and fable, found in many civilisations but is most notable in Chinese and Welsh folklore where they are revered and held in high esteem. The English Patron Saint, George, on the other hand killed off the last of the English dragons in the dark ages and all living relatives migrated to the other side of Offa’s Dyke where they would be safe. Thereafter, the only appearance of dragons in England was to be on emblems such as the Standard of Henry Tudor. 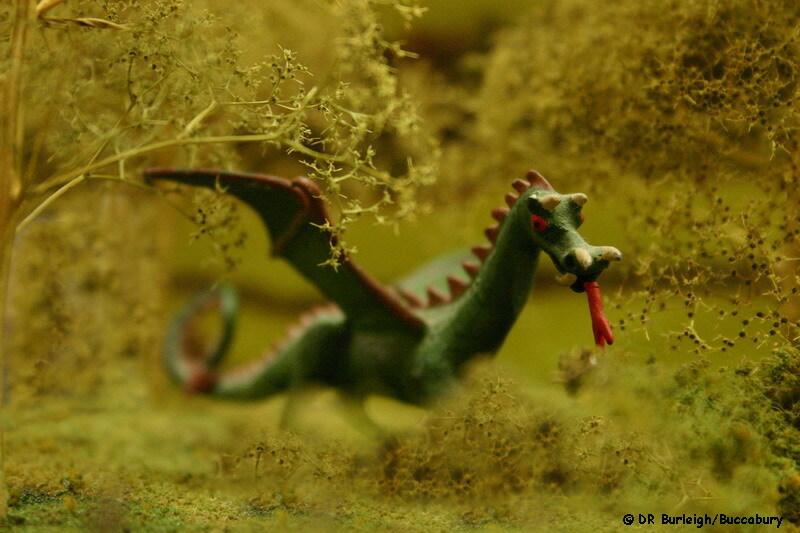 Our resident dragons at Llanmynach are of course creatures not of legend and myth but are as real as all Welsh dragons. Their natural colouring is not bright red obviously but a blend of 'earthy' shades, as befits a creature which relies on camouflage in its normal habitat. They only take on the red colouring when fighting or mating, so people looking out for red dragons in our part of Wales are apt to be somewhat disappointed. 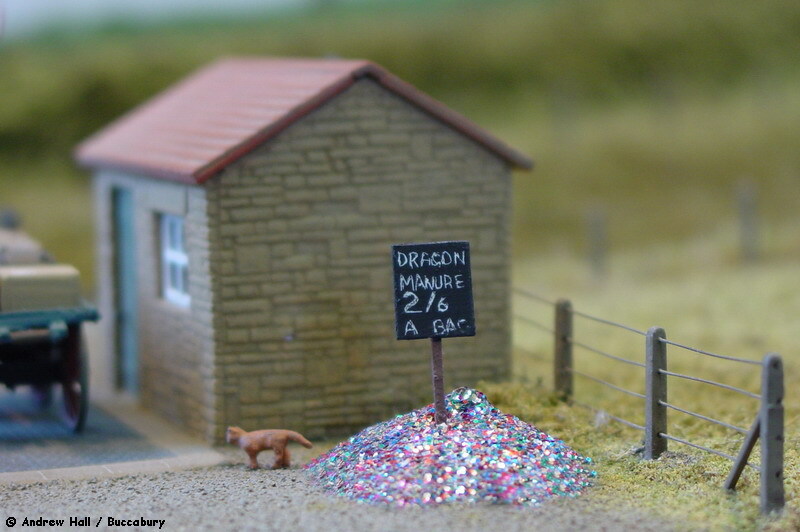 Draco Nobilis © DRB/Buccabury The first photograph shows our ancient dragon (Draco Nobilis), 'Rhiwallon', on one of his regular visits to the workshops to get his toenails clipped by the blacksmith. We don't actually know Rhiwallon’s age, as dragons can live for many centuries - his name dates from at least the 6th Century. He appeared before the Railway, shortly after slate mining was started so we don't know whether he was disturbed by the mining or found the newly-formed caves to his liking and decided to stay. We suspect the latter, as he's always been benevolent towards the Railway and seems to have adopted it as his sort of mascot. We think he’s found the steam locos to be kindred spirits of a kind because they’re hot, they belch steam, smoke and occasionally fire and they snort and whistle. He's usually to be found up in the mountains and on warm days he'll lie in the fields near the line, one eye just slightly open, watching the trains (and probably looking out for the occasional stray sheep, too). With his wings and ears folded and his eyes closed he looks for all the world like a pile of rocks. Any passenger is more than likely to mistake him for such with just a passing glance; little wonder that tourists to Wales are always complaining that they never see dragons - they just don't bother to look properly! When called upon, he's happy to help out, shifting trees, digging out the occasional rockslide or shunting rolling stock with his nose. He's quite popular with the farmers in autumn, when they need controlled stubble-burning! © DRB/Buccabury Our more domesticated swamp dragons (Draco Vulgaris) on the other hand are fairly easy to tame and we always get them in pairs, usually from the higher areas in the Cader Idris range. They have similar status to a working dog and we employ them for a number of different jobs but most importantly for lighting up the locomotives in the morning. Like all dragons, they are highly intelligent and because they have a sweet tooth light-up training is fairly simple; in a short time they can be trusted to work without supervision. Training new arrivals starts by taking them around in the early mornings to each loco which they are required to light up. When they have the fire burning nicely, they are given a chocolate bar as a reward. At the next stage, the chocolate bar is ready on the shelf above the firehole door and it is removed and given to them. Their natural curiosity means that once unsupervised, they will investigate every loco footplate for chocolate bars and they quickly learn that each loco they are required to light will have a similar confection on the shelf above the firehole door. They’ll ignite the ready made-up fire and then nose the door shut; the quicker they are at getting the fire going, the less melted the chocolate bar will be! The rest of the day is usually spent powering or sleeping in one of the forges or 'exploring'. During the winter they are occasionally hired out for use as portable heaters. We're very kind to our dragons and never, ever punish them. This is partly because we’re kind to animals anyway and partly due to a strong sense of self-preservation. Only someone very foolish would strike a creature which is capable of exploding and demolishing the workshop roof. To illustrate the point, back in the 1930s a loose wagon ran into one. We were picking up slivers of slate and bits of dragon for weeks and all we ever found of the wagon was one wheelset which had landed in the Works water tank. Getting them down from Cader Idris wasn't a problem because a local farmer moved them in a steel sheep-carrier behind his tractor. Unfortunately the contractor who undertook the road delivery wasn't experienced in dragon transport and made the mistake of moving then in a wooden crate with lots of nice comfy straw inside! The ride on the rough A.E.C. 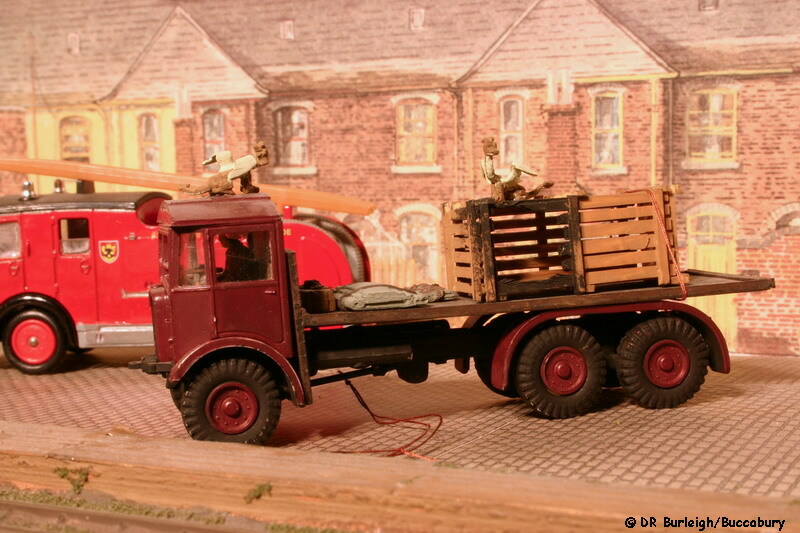 0854 flatbed disturbed them somewhat and the lorry had to drive through the town with fire and smoke belching from the crate. The local Fire Brigade was summoned but the fire was extinguished before they arrived. The works manager finally managed to coax the pair down using chocolate bars to gain their confidence. 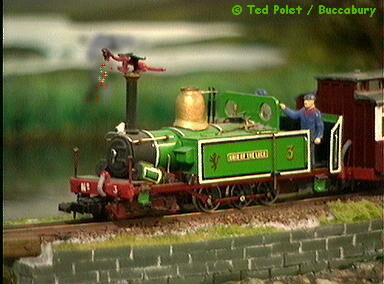 These two young and somewhat excitable swamp dragons were not without incident in their early career with the Railway. Quite some time after their arrival the Llanmynach Town Commissioners called the Board of the L&TR to a meeting in which they demanded that the Railway completely fence off its land from the rest of the town. There had been one or two complaints that they were straying from the Railway and frightening the horses. The final straw came when Fflamddwyn, who, like all dragons is naturally inquisitive, put his head down a drain grating to investigate the gurgling. He got stuck, panicked, hiccoughed, sneezed and caused a chain reaction of explosions of methane pockets in the town’s sewer systems. This wouldn’t have been quite so bad 'cos it killed all the rats' but several people were struck by flying manhole covers and the public lavatories needed re-decorating afterwards. We might have got off with a stern warning but it occurred during a Civic function and the Mayor just happened to have slipped away to make use of one at the wrong moment so he continued to be personally involved after the reporters and photographers had been paid off and once the burns had healed. We finally managed to pacify Fflamddwyn and get the drain cover off his neck. We had to hacksaw it off as we wouldn't dare break it with a hammer and dragons will naturally try to fight anything hotter and noisier than themselves so we couldn't burn it off with the Oxy-Acetylene set. He's now lost the terrified and surprised expression but is very wary about putting his head into anything he doesn't know is safe. Dragons are pretty robust creatures and he recovered in time; his natural curiosity didn't desert him for long and he was soon back to his usual investigating. Once the burns had healed and people had forgotten the incident, the Loco Superintendent decided to try something similar to clear boiler tubes - he thought it might be easier than rodding out. First, he dribbled some petrol into the tubes and let the vapours percolate for about half an hour. Then he opened the firebox and smokebox doors, took Ceridwen up onto the footplate, tickled her nose and induced her to sneeze. It wasn't a great success. It certainly cleared the tubes but it also melted the brass bushes which held them into the firebox throatplate. It melted the fuseable plug, too. Also, at the time the apprentice, who was blissfully unaware of what was happening, decided it would be a good idea to oil the front coupler. He eventually recovered from the concussion he received from the lump of clinker moving at near-supersonic speed and in time his eyebrows grew back. 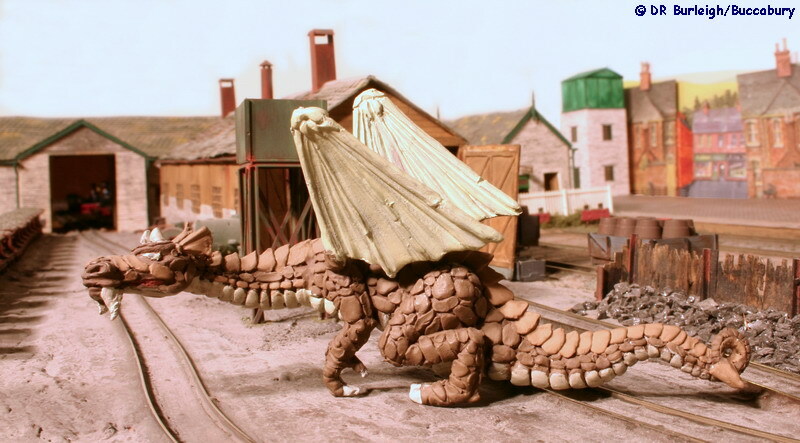 Unfortunately it also meant that we had a dragon who had lost confidence and needed to be re-trained because she wouldn’t go near a loco cab for weeks, far less be encouraged to light the fire! That was mainly because of the rather unfortunate and totally unexpected blowback she experienced. Luckily most of the fireball went downwards into the ashpan but then it bounced back into the shed and cannoned into the pit where it ignited the petrol vapours which had collected down there. This second fireball ricocheted up into the rafters and set fire to oily deposits inside the smoke vents which then blew flames out across the roof. Immediately, several seagulls were seen squawking, tail feathers alight, diving headlong into the water tank. The seagulls haven't perched on the smoke outlets since then and for some weeks afterwards locomotives were being withdrawn from service with clack valves being jammed open with bits of charred feather. 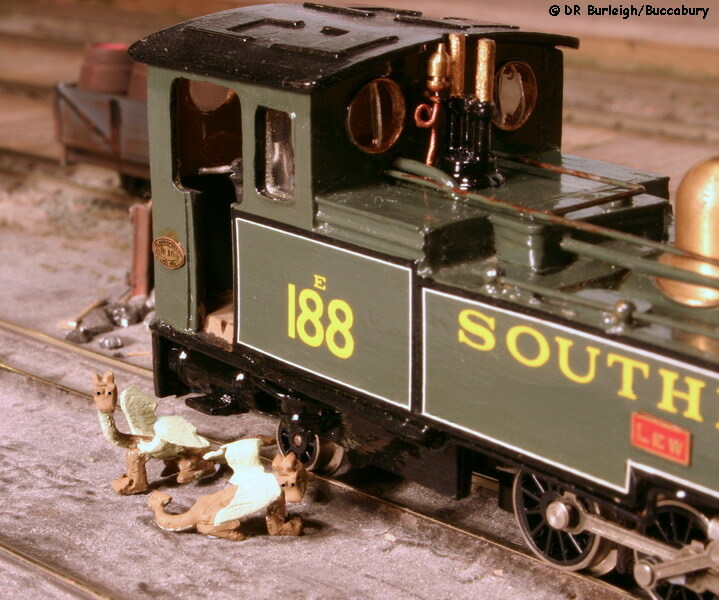 The well-known Craigcorrie & Dunalistair Railway, on the other hand uses tame haggises to tend their locomotives although many years ago a dragon appeared there and took up residence as the following photograph and extract from the Dunalistair Herald of 28th March 1902 shows: Apologies for the faded condition. Yesterday Angus Macnab, a locomotive driver on the Craigcorrie & Dunalistair Railway, reported having seen a dragon near Loch na Cailliche on Inverlochan Moor. The creature is reported to be bright red in colour, with black leathery wings, and breathes fire and smoke. On the approach of the train it appeared to be overjoyed to see the locomotive, blowing long jets of fire and smoke from its nostrils and hooting merrily with joy. Apparently it mistook the locomotive for one of its own kind. When Mr Macnab stopped the train, he claims the dragon first flew to the chimney to inhale its smoke, and then went to warm its feet on the safety valve cover. How a dragon of all things appeared in Scotland is a complete mystery. Dr Jameson, the veterinarian, supposes it must have blown over from Wales during the recent heavy Southwesterly gales. He has received word from a friend in Llanmynach, Mid-Wales, that one of the resident swamp dragons (Draco Vulgaris) has been missing over the past weeks. It may have ended up here. The latest report of the dragon comes from Rae Bridge works, where it is said to have taken up residence in the boiler house 'lum'. © Ted Polet/Buccabury This certainly fits in with the ‘disappearing dragons’ theory which has long been held in our part of Wales, that if swamp dragons try flying in very windy weather they are not strong enough to prevent themselves being blown away. My grateful thanks to Mr. Ted Polet, owner of the Craigcorrie & Dunalistair Railway for his permission to use the photograph and extract from the Dunalistair Herald. © AH/Buccabury It is thought that some descendants of English Dragons, now living in Wales, make occasional forays across the border to make their feelings about St George better felt. Occasional evidence of this may be found as shown in this photograph of Aldbourne, the railway owned and operated by Adrian Ponting. It is understood that this rare substance was discovered by John Bruce who undertook to ship it to Aldbourne for sale where, apparently, the roses and rhubarb grow at an astonishing rate. © DRB/Buccabury As I've noted above English dragons are unknown, or so it is said. However, this magnificent example was seen recently near the village of Treacle Bolly. By the colouring it would appear that this is a forest-dwelling creature and this is indeed a rare sighting as they usually live deep in the forests, seldom venturing into open country. It is said that forest dragons have an omnivorous diet; as they are unable to rely entirely on straying domesticated or unwary wild animals they have evolved to supplement their food by eating some of the forest vegetation. Note also that although the size is similar to the 'Draco Nobilis' at Llanmynach, 'Draco Silva' is much slimmer and more lithe. This is presumed to be due to the fact that it needs to slink around the forest easily. Although they rarely leave the forest, local records show that throughout the centuries domestic pets have tended to disappear during winter months, generally during the hours of darkness when things are quiet. 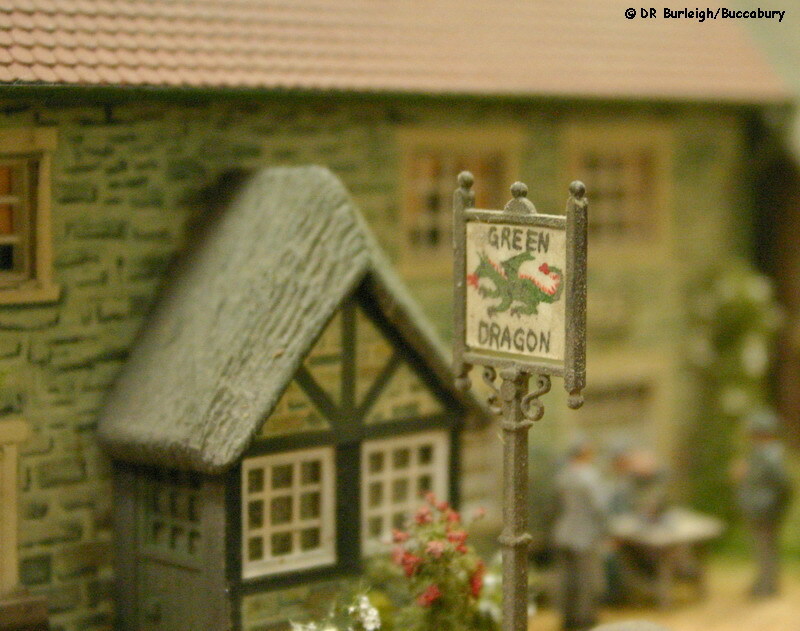 © DRB/Buccabury This rare dragon has been a part of the Village folklore for many years because the public house bears the name of the "Green Dragon" and the illustration on the sign is so much like the dragon itself that it may indeed have been taken from descriptions of this very creature. Patrons leaving the pub after closing time have often claimed to have seen a dragon but this has usually been put down to too much alcohol, a vivid imagination or a glimpse of the landlord's wife. Nevertheless, dragons are know to enjoy cooking their food and recently the charred remains of a number of domestic pets have led the inhabitants to suspect the continued presence of dragons. Certainly this brings a different meaning to the act of putting the cat out at night. The village of Treacle Bolly was originally part of the privately-owned estate of Mr. Adrian Ponting and I am indebted to the new Squire of Treacle Bolly, Mr. Andrew Burnham for permission to use these photographs. I also gratefully acknowledge the material of Terry Pratchett which was, in part at least, a source of some inspiration for this piece. Anyone who’s enjoyed this page and who’s interested in dragons is recommended to read his book "Guards! Guards!"